In bellydance in general we spend a LOT of time on movement and technique. 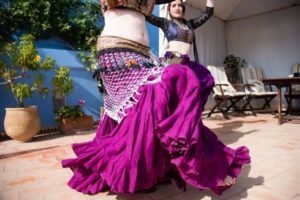 In Level 1 Gypsy Caravan Tribal Bellydance for instance, just Level 1 alone, there are over 20 moves and variations that we learn, digest, carve into our heart, and commit to our dance. As we grow in our dance, we learn to add in cues and clarify our style, so that our sisters and brothers following us can dance alongside, creating harmony and unity in the Tribe. We also challenge ourselves by adding on finger cymbals and learning to listen to the music, so that our dance becomes the visual expression of the sounds that we hear. And the ultimate goal of all of this fun and deliberate learning is to be able to dance, stringing each of these word-like components together into full sentences and then larger paragraphs of songs. A dancer can thoroughly learn all the elements above, and yet still not quite communicate fully with her fellow dancers. So what’s not quite there? It’s the recognition and acknowledgement of transitions. Between the movements there is a delicious pause, a breath, a space that occurs. This is the weight shift from one move to the next, the rearrangement of arms or angling of body for the next move. It’s the logical connection, a coupling, from one movement to the next, but it’s an element that we may sometimes miss. In all forms of dance, smooth transitions give a dancer that liquidy grace that makes the viewer gasp “OH! they make it look easy!” And this is true enough for Tribal. And yet, I’ve found that transitions are especially important in tribal because it is in this moment of choice that the easiest to follow tribal leaders are made. And for followers, being comfortable with standard transitional elements such as weight shifts and direction changes is critical to being able to follow closely. To more fully connect with and practice your transitions, try this little exercise: think about which move would logically go from one to the next. What is easiest to get “into” and “out of”? If your arms are low, say for a bicycle shimmy, is it easier to transition up to Egyptian Basic, or to Ghawazee? You can even practice just for tansitions! Try to add in a bit of practice time where you focus not just on performing the move properly, or stringing it along in a flow, but also thinking about which move works coming after the next. Pay close attention to the feet, especially where you are putting your weight. As you go into one move stop. Yes really! Stop for a moment and check – is your body in the proper place? Are your arms clear and defined for the cue? And did you get to “here” from a place that would be clear for your followers? Then continue with the move. By taking a bit of time to analyze your dance, where it is going and how you are communicating with your body, you will find that the transitions come easier for you as a dancer, and for those who are following you too! And one final note! Keep in mind that this is only one type of practice exercise, specifically intended to help you improve transitions and cueing, and it’s pretty cerebral. So be sure to balance it with a song or three where you crank up the music and just dance!